After 7 weeks of trying to change my shopping habits, cooking methods, cleaning systems and personal care options, St Edmundsury's Zero Waste Week is now upon us and I am really looking forward to the final challenge. Apparently, there are almost 200 people attempting this across the borough, which is fantastic. "Zero Waste means that nothing gets thrown away. As well as trying to cut down what we use, it means that we shop smart so that we only buy things that can be recycled or composted. That way we’re left with nothing else to throw away in the black bin, with the ultimate goal being to reduce the total amount of waste created by buying items with less packaging and reusing items where possible". As part of the Zero Waste challenge, participants are encouraged to "reveal the rubbish" that they have collected for the black bin during the past week. I am amazed by our progress so far. Thanks to using the Composter, Bokashi bin and Wormery, our family has only managed to create a very small bag-full of rubbish during the last week. It's the small white bag that you can see next to the bin wheel and mainly consists of unrecyclable plastic film, a couple of crisp packets and an old deodorant that "expired" a couple of weeks ago. The main reason why the waste is significantly smaller this week is because I've extracted the small plastic bags that can be recycled and have taken them to our local recycling point at Sainsbury's. You can see these in the distinct orange bag to the right of the bin. So, the challenge from tomorrow is to get down to ZERO. You might think that judging by the evidence, it might be easy. But there is a twist. This week the challenge includes rubbish that is created while "on the go", which means I can't just throw away packaging while I am out and about, whether at "work, rest or play" (to coin an old advertising jingle). 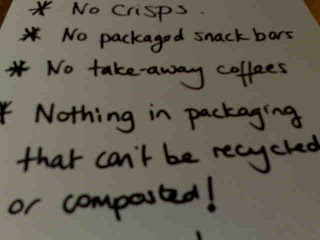 I have to bring it home and declare any non-recyclable\non-compostable stuff to the council. In the words of my 6 year-old "oh, man!" I really am going to have to watch my step. So with a busy week ahead, what's the plan? 1. Although he's generally good at the waste thing, I've really got to get strict with Mr A this week. Sorry, but despite his best efforts, he can be a bit of a loose cannon and I don't want to take the risk of the odd Starbucks paper cup or McDonalds cardboard carton turning up. So I've prepared a set of rules for him to consider while on his travels. Before you think "poor bloke". I will of course make a concerted effort to make his lunches so that he doesn't have to go hunting for food and it goes without saying that all lunches will be provided in reusable containers. 2. I will not forget my shopping bag... I will not forget my shopping bag... I will not forget my shopping bag... I will not forget my shopping bag... I will not forget my shopping bag... I will not forget my shopping bag.............or even my new gorgeous shopping trolley! 3. No plastic carrier bags are allowed. If they slip through the inspection net they will be stored away for future use. 4. I will avoid as many forms of packaging as possible, by shopping at the market. The only packaging that will be allowed in the house will be that which can be recycled or composted. 5. We will experiment with different breakfast options this week and try and make time in the mornings for fresh fruit or eggs as an alternative for cereals, as the inner linings of the cereal cartons can't go into our recycling bin. 6. 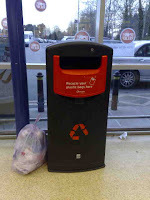 If we happen to get landed with plastic film or bags, I will take them to the recycling point that I have discovered at our local Sainsbury's..
7. If I get any unexpected incidents of pet waste, I will take a walk to the nearest pet waste bin. There are plenty dotted around the area (although some dog walkers might not have noticed and have mistaken tree branches for dog waste disposal units). 8. If Mr A. has a sudden declutter episode, nothing will be put in the bin that can't be reused or recycled. I'll make a concerted effort to put it on Freecycle, in the hope that someone will come and pick it up. 9. 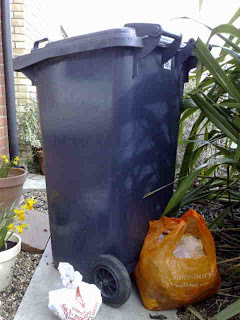 There will be no food waste going in the black bin. Instead I will continue to feed the worms and the birds. However I promise not to feed the worms to the birds. 10. And finally I need to keep motivated, so be prepared for me to continue to talk rubbish all week. In fact I will be talking rubbish to anyone I come across who's willing to listen. Already, I've had a taxi driver discussing his own rubbish, my hairdresser enthralled by the idea, my mother reminiscing about the old days, my son's school signed up to Zero Waste Week, other bloggers discussing the topic, as well as friends taking a really good look at what they throw away. One of them has even booked me to find out how she can put her own bin on a diet. And as ever, I welcome the opportunity for you to continue talking rubbish too. Tell your friends, colleagues, the milkman, the lady at the corner shop. Share your rubbish stories in the playground. Try getting up close and personal and ask your friends about their binbags. But don't forget to keep popping by and sharing your top tips in the comments. If you've signed up to the challenge (officially or not), you're welcome to share details of your progress too. Let the real challenge commence! What will be the fate of the packet you recieved form the local council? It's amusing that they are encouraging no-waste, but generating some for you themselves! Good Luck, Mrs A., from Italy too!!! I hope you'll easily achieve your zero-waste result! It's a hard work to do but the courage of you must be worthy of imitation for many people around the world now! Here's an idea: how about making your own muesli for breakfast? Wife did this recently, following a Jamie Oliver recipe, and it was very tasty. Oh.. but then you have packaging for the oats, and raisins. Damn. Hi Erica - thanks for popping by and for the well wishes. Your story sounds like how my life used to be a few months ago. Hopefully you will find some useful tips. If you let me know the kind of things that go in your bin, I might be able to send over some suggestions. Hi Danda (and hello to Italy). Thanks for the great support. Please do share your experiences of what it's like in your area at the moment. I am sure everyone would be interested. Health food shops are a good place to try and buy museli loose from a bin. You could take your own container to the store so you don't have to take any bags...It takes commitment to become a size zero! Thanks Kate, that's a great idea. Indeed one of my friends has taken some jars off me to store the loose spices that she can get from our health store.